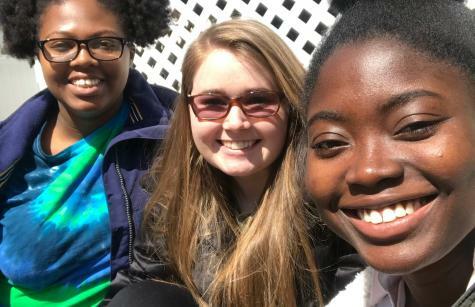 During Spring Break at Notre Dame of Maryland University this year, three students, Allison, Johnitta, Bria, and I traveled to Connecticut where we spent a week of Service Learning at the Caroline House in Bridgeport, a center where immigrant women and their children come to learn English and life skills. This trip marked the first SSND Mission Awareness Process (MAP) experience at the new Caroline House/Villa Notre Dame site. Our first day at Caroline House was a day of much joy and laughter in that warm old house. The many rooms of this three-story gathering place were filled with women from all around the world, each there to eagerly learn English and to form community. The smiles and "how are yous" that greeted us were warm and welcoming. The joy was palpable as they practiced their English in the classrooms, laughed at their mistakes, and encouraging one another, applauded each other’s success. That first day I couldn't believe how much we laughed - it was fun! Then as we moved through the days and listened to the women’s stories, I was reminded that we were still in Lent, still in a world of pain, injustice and struggle. There was Ana, trying to help her family members in Venezuela, who were suffering from lack of food, electricity and water. Maria, from Honduras, at age 73, was just beginning to study English for the first time. Until now she had had to work long hours in a factory to help support her family and couldn’t make it to the classes. Luisa was just promoted to supervisor at Wendy's and now earns $14 an hour. She comes to class every day at 9 a.m. after working the night shift from 11 p.m. to 7 a.m. at the fast-food chain. And when Isabel, here from Spain, was asked what she missed most about her country, she said so spontaneously, "Everyone and everything. I cry every day.” The pain from the separation of families that so many spoke of was heartbreaking. Many women also spoke of wanting a good education for their children. When Blanca heard I worked with first-generation Latina students at Notre Dame, she wanted to know if her 16-year-old daughter, who is undocumented, could come to our school. Despite the tremendous hardship and pain, these women study their English with such fervor and determination. Yosenis is another who so wants to make a difference in this world. She is part of a civic group in Bridgeport that is very politically involved. She had gone to Washington, D.C. over the weekend to fight for educational opportunities for children and ended up at the same luncheon attended by Cory Booker, Elizabeth Warren and Joe Biden! The whole experience for me was truly one of hope even in the midst of struggle. All we had to do was listen, listen to the stories and realize everyone has a story. As these women shared their difficulties and fears with us, the gift of hope that is theirs was amazing to behold - the determination to work hard, press forward and encourage others on the journey. Sometimes in working for immigration reform, we can get discouraged with the seemingly slow progress that is made. However, for these women, giving up was not in their vocabulary. Transformation happens one email at a time, one phone call or smile at a time, one conversation at a time with someone ensnarled in the immigration process - or even, as we learned when sisters at a Solidarity Day meeting gave us a donation, one contribution at a time to an SSND sponsored ministry working for immigrants. Let us be a part of the new world coming - be part of the movement toward unity, walking hand-in-hand with all of our brothers and sisters, "making one”- realizing Christ's and Mother Theresa's dream.